In a pan, brown sausage. Stir in remaining ingredients and bring to a boil. I found this recipe this week in one of my magazines. It was quick and easy and I had most of the ingredients on hand. I didn't have any keilbasa sausage, but I had a smoked sausage and used it. 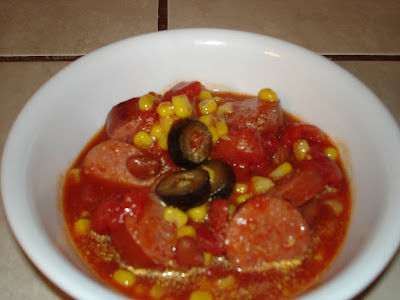 It was pretty good, but I think for future reference I would use fresh tomatoes, a can of tomato sauce and a keilbasa sausage. Let me know what you guys think.